Steve King isn’t an anomaly. He’s the natural outcome of the @GOP‘s Southern Strategy. Since it began, Republicans used racist dog whistles to gaslight their base and scapegoat minorities. 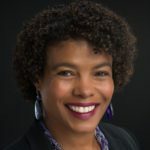 Terri E. Givens is a political scientist and a consultant to educational technology companies and educational institutions. She was the provost of Menlo College from 2015 to 2018. From the fall of 2003 until the spring of 2015, she was an administrator and professor at the University of Texas at Austin.